This paper examines the behavior of Cuba’s gross domestic product (GDP) per capita during the second half of the 20th Century—a controversial period of Cuban history dominated by the rule of the “revolutionary” government that came to power in January 1959. The analysis of this important indicator of welfare1 relies on newly available data supplied by Angus Maddison (2001) in his book The World Economy—A Millennial Perspective. In this important addition to his already formidable contribution to economic history and statistics, Maddison provides time series for domestic production and population for the period 1950–1998 for most countries in the world. The data for GDP are expressed in international Geadry- Khamis dollars, which allows for cross-country comparisons. The first section of this paper describes the historical evolution of Cuba’s output per head and the second examines its relation to a number of key variables, including the level of Soviet assistance, the intensity of the Cuban government’s anti-market policies, and the “embargo” imposed by the United States during most of the period. The third section examines these relations more rigorously through regression analysis; and the fourth section presents some rough estimates of the possible magnitude of these policy effects. The final section compares the evolution of per capita output in Cuba with that of a number of developing countries in Latin America, the Caribbean, and East Asia. The Annex provides sources and explains methods for the variables used in the regressions. The heavy line in Figure 1 shows the evolution of per capita GDP in Cuba during the Maddison sample period. It begins in 1950, nine years before the victory of Fidel Castro’s 26 of July Movement over the regime of General Fulgencio Batista, and ends in 1998. The dotted line in Figure 1 shows the behavior of GDP per capita at 1997 prices, as reported by the official Oficina Nacional de Estadísticas (ONE),2 a series that is available only since 1989. It is noteworthy that there is a strong correlation between the Maddison and the ONE series, particularly during this period of unusual turbulence. There is another fairly long series of aggregate production in Cuba which refers to Net Material Product (NMP) (Madrid-Aris, 1998). However, NMP differs conceptually from GDP in that it excludes the output of services (a serious drawback in a country where services account for most of the value of production). Moreover, NMP (unlike GDP) allows for cascading effects of intermediate inputs rather than measuring value added only. When all is said and done, NMP underestimates the size of the nation’s output by a considerable margin. Maddison’s time series for GDP thus improves on the existing alternatives in terms of length, technical quality, and international comparability; it is the principal output variable considered in this paper. 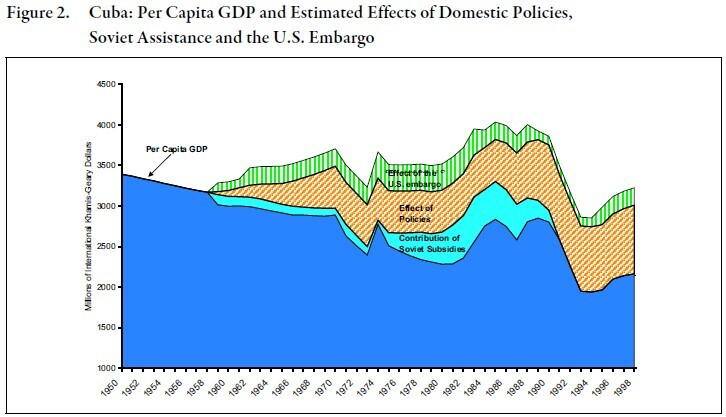 In Figure 1, this series suggests that Cuba suffered a steady decline in GDP per capita during the period 1950–1998 as a whole. The decline already began during the 1950s (during the governments of Carlos Prío Socarrás and Batista), and continued during the “revolutionary” decades of the 1960s and the 1970s, as the free market system was dismantled and the command system implemented. After 1970 there were significant ups and downs, including a strong recovery during the first half of the1980s that appears to have been related to the provision of large scale Soviet aid, and to a softening of anti-market policies.3 Output per capita dropped sharply after 1998 with the disappearance of Soviet aid (and soon after of the Soviet Union itself), and began to recover only after the implementation of a stabilization and reform plan in 1993–94. On the basis of official data, which have become controversial in the past few years, the economy in 2007 appears to have barely recovered to the previous peak recorded in 1986. This broad brush period picture can be refined in various ways. Table 1 shows the alternation of economicpolicy sub-periods during the half-century, and provides some historical context.4 The decade of the 1950s featured a capitalist, relatively free market economy under the democratic government of Carlos Prío and the dictatorship of Fulgencio Batista. The following period, from 1959 to 2006, corresponds to the revolutionary government of Fidel Castro and includes roughly two types of sub-periods: (1) those dominated by hard line, anti-market policies associated with Guevara– Mao utopian/romantic views and the use of “moral” incentives; and (2) the more pragmatic and slightly market friendlier policies occasionally associated with pro-Soviet leaders like Carlos Rafael Rodríguez and Raúl Castro. The distinction does not fit the traditional Bolshevik contraposition between “leftists” and “rightists.” For example, the tendency of Cuban “pragmatists” to rely on central planning and budgets reflects their interest in accountability and measurable results, rather than Marxist orthodoxy. In any event, as Mesa-Lago and others have correctly pointed out, the importance of differences in policy orientation among factions should not be exaggerated. In the end President Fidel Castro did what he wanted, when he wanted; and while he showed considerable tactical flexibility at various times, his strategic inclinations were almost always on the side of utopian socialism, as long as this allowed him to continue to rule single- handedly. A systematic analysis of the determinants of output during our period is difficult because many of the key variables required are not available for such a long period. This applies to capital formation and labor force, thus precluding the use of a production-function approach or a Dennison-type growth-accounting exercise. Capital stock figures are only available from 1959 to 1987 (Madrid-Aris, 1998), and they cover only the “productive sphere” of the Cuban economy, thus excluding services. As regards the labor force, a sufficiently long time series could be constructed thanks to the heroic contribution of García Díaz (2004), who tried to bring some order into the maze of official statistics on working age population. But this series failed to show any explanatory power when used to construct a proxy for the participation rate—a variable that should, in principle, contribute to the explanation of the GDP/population ratio. The difficulties are even more severe in the case of employment, where official sources provide a variety of inconsistent series in a futile attempt to conceal the size of the armed forces. All this illustrates the difficulties of the task at hand, a task that must rely as much on the methods of Inspector Maigret and Father Brown as on those of the economic historian. • Economic assistance to Cuba by the U.S.S.R., a major determinant of GDP because of its contribution to the economy’s total saving and investment, with possible multiplier-accelerator effects in the short-run. • Sugar production, which is treated as exogenous because it is heavily affected by climatic conditions. • Several proxy variables constructed to gauge the effects on the Cuban economy of (1) domestic economic polices and (2) the U.S. embargo. The domestic policy variables are intended to capture, albeit very roughly, the intensity of the economic distortions and adverse incentives to work and invest resulting from government policies after 1958. Some of the variables that could have provided a fairly direct measure of these distortions and disincentives, such as the relative size of the state economy, were not available for the early part of the sample period. Three proxies intended to capture these effects, were constructed. 1. 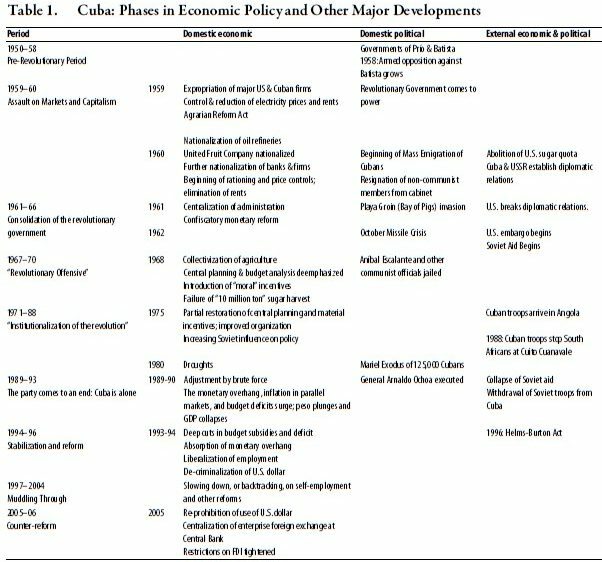 The first proxy relies on information provided by Carmelo Mesa-Lago (2005) in the form of a table breaking down the period 1959–2004 into sub-periods that correspond to different phases in the evolution of economic policies. He then defines a number of key policy variables and provides his judgment as to whether changes in each variable in any given sub-period improve or deteriorate economic conditions. On the basis of Mesa-Lago’s scoring, we construct an aggregate indicator of policies by selecting 12 of his domestic policy indicators5 and calculating, within each policy period, the number of indicators that worsen – in the sense that they move in the direction of lowering output. This variable is then annualized and accumulated. More details are provided in the Annex. 3. The third proxy is the ratio of narrow money to GDP. On the assumption that the structural demand for money is a relatively stable function of income, changes in this ratio would reflect changes in the excess supply of money and therefore changes in the gap between actual and controlled prices. This in turn would be related to the gap between effective and observed labor supply and the dead-weight loss of output associated with the monetary overhang. As a very rough proxy for the possible impact of the U.S. “embargo” we use a variable consisting of integers between zero and 3, with higher values corresponding to more severe effects of trade restrictions. The variable is equal to zero during the 1950s. 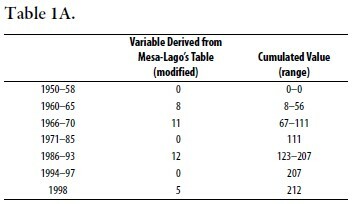 Beginning in 1960, when Cuba’s sugar quota was eliminated and a trade embargo imposed, the variable takes on values ranging from 1 to 3, taking into account known events (such as the Helms-Burton Act of 1996), and the views of both Mesa-Lago (2005, Table 1) and the author. This indicator is, of course, very crude, as it is essentially ordinal and assumes arbitrarily that changes in the intensity of the embargo occur only according to the periods defined in Table 1. Just as the policy variables discussed above—with the exception of the money to GDP ratio—the “embargo” variable contains an element of subjectivity and must be interpreted with a higher than usual degree of caution. 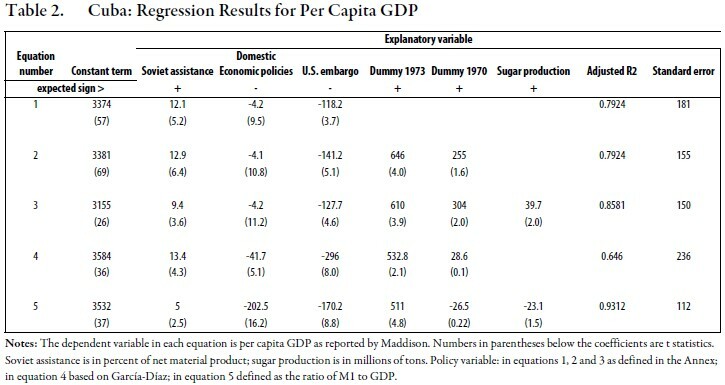 A set of linear regressions was estimated by Ordinary Least Squares using Maddison’s per capita GDP for Cuba as the dependent variable and the explanatory variables discussed in the previous section. The main results are shown in Table 2. It must be stressed again that, in view of the lack of several key variables like the capital stock and the roughness of some of the indicators, the regression results should be interpreted very carefully. Nevertheless, some of the findings are noteworthy. Equation 1 shows the coefficients of the three principal policy variables (the level of Soviet assistance, and the proxies for the quality of domestic policies and for the U.S. embargo). Each has the expected signs and is significantly different form zero.6 In general, these results persist when other variables are added. Equation 2 introduces two dummy variables: one for 1970, to capture any effect of the “zafra de los 10 millones”; and one for 1973 to adjust for an apparent error in the data. The coefficient of the 1973 dummy is significant and consistent with the hypothesis of a data error. Accordingly, the data for 1973 used in Figure 1 of this paper has been adjusted downward in line with the regression coefficient of the dummy. The positive sign on the “zafra” dummy suggests that the one-year effect of the campaign to produce 10 million tons of sugar was to increase GDP, although the psychological effect of failing to meet the target was serious. Furthermore, the “zafra” variable lacked robustness with regard to changes in specification; in Equation 4, for example, the coefficient has the wrong sign. Equation 3 introduces the level of sugar output as an independent variable. The estimated coefficient is positive, as expected, but barely significant; and the contribution to the overall fit of the equation is small. Equation 4 introduces the alternative version of the domestic policy proxy based on the variable proposed by García Díaz (2004, Cuadro 41) under the name of “estímulo” (see Annex). The coefficient of this alternative variable is correctly signed and significant, although the fit for Equation 4 is somewhat lower than for Equations 1 to 3. Finally, Equation 5 shows an attempt to use the narrow money to income ratio as a proxy for the effects of domestic policies. The theoretical basis for this approach is that a rise in this ratio (assuming a relatively constant structural relation between desired money balances and income) should signal a rise in the excess supply of money, and therefore a widening of the gap between controlled and equilibrium prices, and the difference between the actual and the equilibrium supply of output.7 Unfortunately, the statistical base for money is weak: the record is fairly complete after 1988; but there are a number of gaps in the earlier period that had to be filled by guesses or by interpolation. The regression results presented in Table 2 can be used to calculate the contribution of each of the explanatory variables to the dependent variable. More formally, if y is per capita income, a is a vector of estimated coefficients, and x is a vector of independent variables, then the contribution of the ith independent variable to the level of y is c(xi) = aixi. Figure 2 illustrates the main features of this accounting exercise. The dark area represents the evolution of actual, per capita GDP, with the relatively light part of that area representing the contribution of Soviet subsidies. The mechanical interpretation of this result is that GDP per capita in the 1980s would have been 20 to 30 per cent below its actual level had it not been for the Soviet subsidies. But this interpretation requires a strong assumption, namely that national saving and investment would have remained unchanged in the absence of Soviet aid. The light diagonally-shaded area shows the negative contribution of state policies to the level of per capita GDP. This effect grows rapidly during the 1960s and averages about 20% of actual output per capita income in the 1970s and around 40% in the first half of the 1990s. Finally the estimated impact of the U.S. embargo is indicated by the light vertically-shaded area. It is substantial, amounting to 12% of GDP at its peak in the late 1970s—a surprisingly large estimate given that the effects of U.S. trade restrictions can be partly evaded by importing from other trading partners. But the adverse effect of the embargo is considerably smaller than that of domestic policies. What Jorge Sanguinetty has called the “internal blockade” has done much more harm than the external blockade. The combined effect of unwise domestic policies and the embargo is huge: by the end of the sample period, income per person was about one half of what it would have been had Cuba not embarked on the long adventure that destroyed its market economy and antagonized its powerful northern neighbor. Again, this is a somewhat mechanical way of looking at things, one that does not do justice to the full complexity of history. By way of example, had the “revolutionary” adventure not taken place, Cuba probably would not have spent considerable resources in military ventures in Latin America and Africa, and it might have received much larger and more productive inflows of private foreign investment. On both counts Cuba’s standards of living would have been raised well above what can be gleaned from the top line in Figure 2. Of course, under that alternative scenario, Cuba almost certainly would not have received Soviet assistance. In summary, this quantitative interpretation of history is a tricky exercise, and questions like “what would have been the evolution of GDP had the 1959 revolution not triumphed” are almost impossible to answer. Nevertheless, a few important conclusions seem to emerge from the analysis. • Misguided economic policies lowered Cuba’s output per capita well below what it otherwise would have been. • The impact of the U.S. embargo was significant, albeit considerably smaller than that of domestic policies. • Subsidies and financial assistance from the former Soviet Union allowed the Cuban economy to grow during the 1970s and the first half of the 1980s, and their interruption contributed to the sharp contraction of output in the early 1990s. HOW DID CUBA COMPARE WITH OTHER DEVELOPING COUNTRIES DURING THE SECOND HALF OF THE 20TH CENTURY? Since the Geary-Khamis estimates are defined in a common currency, they can be used to compare GDP per capita levels across countries. 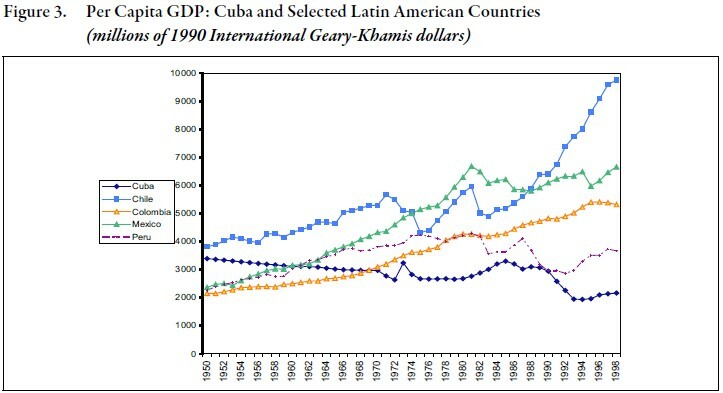 In Figure 3, Cuba’s GDP per capita is shown together with that of four medium to large Latin American nations: Chile (where output per head in 1959 was a little above Cuba’s); and Colombia, Mexico and Peru (where it was somewhat below). 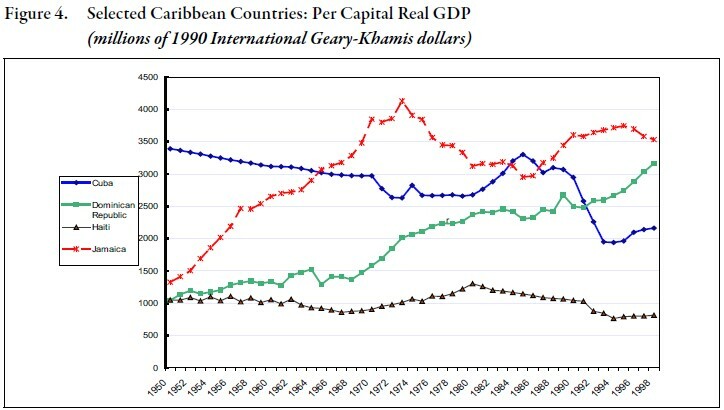 By the end of the period, in 1998, GDP per capita in all four countries was well above the Cuban level. In the case of Chile, the income gap widened sharply in spite of a period of stagnation during the Allende and Pinochet years, as output surged under the democratic governments that followed. Mexico grew steadily from the 1950s to the early 1970s in spite of a rapid rate of increase in population; the Mexican economy stagnated during the “lost decade” of the debt crisis in the 1980s and grew slowly during the reform period of the 1990s, but still ended up at more than twice the Cuban level in 1998. Colombia’s expansion was relatively slow, but remarkably steady given the political instability affecting the country, as policy- makers avoided the problems of excessive debt and high inflation. In 1998 Colombia’s income per head was twice as high as Cuba’s. Fig. 4 shows per capita incomes for Cuba and three other Caribbean countries that began the period at a much lower level than Cuba. Jamaica expanded rapidly from 1950 to the mid-1970s, but suffered a significant recession through the late 1980s before recovering somewhat in the 1990s. In spite of these gyrations, Jamaica ended the period well above Cuba. So did the Dominican Republic, on the basis of a much steadier expansion. Haiti is the only country in the group that failed to narrow the income gap and remained well below Cuba’s level in 1998. Puerto-Rico is not in Figure 4 because it does not fit in the chart. By 1998 income per person in the neighboring island was eight times higher than in Cuba. Cuba and the East Asian countries have been suggested as models for economic development, the first from a “socialist” perspective, and the others from an export- oriented, capitalist perspective. It is therefore important to compare their performance over a long time period. This is done in Figure 5. 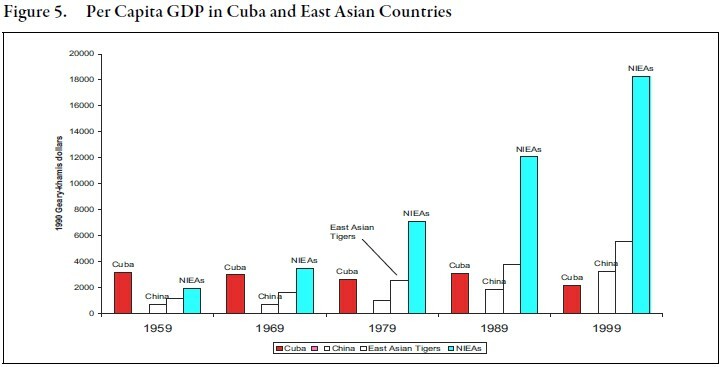 Real GDP per capita in all the East Asian country groups was well below Cuba’s level in 1959. But the evolution over the next half century was remarkable. In China output per head was only one fifth of the Cuban level in 1959, but by 1989 China’s GDP per capita was one and one-half times larger than Cuba’s. For the East Asian Tigers (Thailand, Malaysia and Indonesia), GDP at the end of the period was 2.5 times larger than in Cuba. Even more dramatically, in 1989 income per head was more than 8 times larger in the four Newly Industrialized Countries of Asia (Hong Kong, Korea, Singapore, and the Chinese province of Taiwan). The result of these inter-country comparisons is depressively striking. Undoubtedly, there were times when mistakes and accidents reduced growth below potential in many parts of the developing world. In Mexico and other Latin American countries the debt crisis resulted in a “lost decade,” and in East Asia the economic expansion was temporarily interrupted by the Asian crisis of the late 1990s. But Cuba’s fate was much worse: because of wrong-headed economic policies and self-imposed isolation, the country has lost half a century of growth. 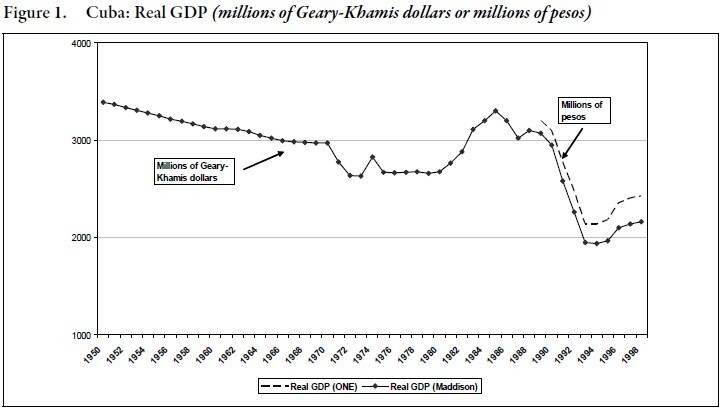 Real GDP and per capita real GDP, in Geary-Khamis international dollars. From Maddison (2001). Comparability and the calculation of regional and world aggregates require that national GDP estimates be defined in the same currency. This can be achieved by selecting a numeraire, usually the U.S. dollar, and converting each national estimate of GDP into dollars by using the appropriate exchange rate. An alternative method, that avoids imparting to national GDP estimates the occasionally sharp fluctuations experienced by market exchange rates, is to use purchasing power parity (PPP) convertors. These include those prepared be the International Comparison Programme (ICT) of the United Nations, Eurostat and the OECD, preferred by Maddison, and those calculated as part of the Pennn World Tables (PWT) by Summers and Heston. Maddison uses all these factors depending on availability and country. For each country, national GDP data expressed in local currency, typically from official sources, are translated into international dollars using the appropriate converter. The convertors for some relatively small countries, for which neither ICP nor PWT convertors were available, including Cuba, are based on proxy values. In the case of Cuba, Maddison assumed the average GDP level was 15% below the Latin American average. Soviet aid to Cuba. Calculated as the sum of price subsidies on Soviet sugar and nickel imports from Cuba and Soviet oil exports to Cuba, plus an estimate of Soviet financial aid (Source: Madrid-Aris, 1998). Total population. Source: Oficina Nacional de Estadísticas (ONE), Anuario Estadístico de Cuba, various issues. There are a few exceptions. In the period 1989–93 the variable was given an unfavorable rating of 12 in spite of the more favorable (lower) rating that would result from a strict interpretation of Mesa-Lago’s table, mostly because of the unfortunate macro-strategy of letting subsidies to enterprises and the budget deficit soar while financing the deficit largely through excess money creation and longer rationing lines. Conversely, the period 1994–97 was given a favorable (low) rating of zero because of the strong stabilization effort and the various pro-market measures adopted in 1993–94. The periodic policy numbers were annualized over the entire sample period and then accumulated. (See righthand column of Table A-1). Since the initial variable indicates the effect of changes in policies on the growth of GDP, the integral of this variable should be used to explain the level of GDP. Embargo. Proxy variable intended to capture the adverse effects on Cuba’s domestic output of the “boycott” or “embargo” imposed by the United States. Money to GDP ratio. The numerator is defined as money in circulation, i.e., the sum of currency in the hands of the public (efectivo) plus saving deposits (depósitos de ahorro). The sources are A Study on Cuba (1965) for the period 1950–1960; ONE, Anuario Estadístico de Cuba, various issues; Alonso and Lago (1995); and author’s calculations. There are, however numerous gaps over which the data had to be “produced” by linear interpolation. 1. Of course, per capita GDP is not the only indicator of well being. Other important variables, including the incidence of poverty, education, public health and the degree of political freedom, are not considered in this study which does not mean they are not important. 2. See the Annex for an explanation of how these series were derived. 3. Maddison’s series include a temporary surge in output in 1973 which is not reflected in any other major indicator of production (like sugar output) and is therefore assumed to be an error. The 1973 data point for this series in Figure 1 of this paper is adjusted downward using the dummy variable coefficient reported in Table 2. 4. The breakdown between phases follows mostly Mesa-Lago and Pérez-López (2005), with inputs from other sources including Madrid- Aris (1998) and Garcia Díaz (2004). 5. The indicators used here are listed in the Annex. 6. All statements about significance are based on one-tailed t-tests and a 1% confidence interval. 8. Other indicators listed by Mesa-Lago but not included in the present exercise (because of their endogeneity) are economic growth, monetary liquidity, the fiscal deficit, the merchandise trade deficit, and “open” unemployment.